In Pollok, Texas – about 150 miles (240km) southeast from Dallas – two children were killed when their family car was hit by a falling pine tree. According to Capt Alton Lenderman of the Angelina County Sheriff’s Office, the tree “flattened the car like a pancake”, but the parents, who were riding in the front of the vehicle, were not injured. 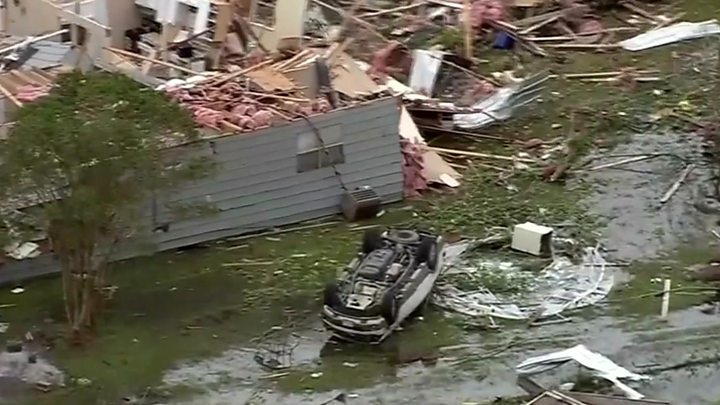 In Alto, Texas, one person was killed and around two dozen others were injured after a suspected tornado struck a Native American cultural event, Cherokee County officials told the Associated Press. Hamilton, Mississippi, also saw dozens of homes destroyed, along with the community’s fire station. On Monday, the storm system moved east, causing travel delays in New York, New Jersey and Pennsylvania. Windy conditions and rain have been forecast for the Boston Marathon as well.